Veggies in the oven make the kitchen toasty warm and I love that on a cool fall day! Whether you roast or bake, the oven is a wonderful place to cook vegetables! Before the advent of microwave ovens, pretty much everyone baked potatoes and sweet potatoes in their full size, conventional oven. It wasn’t as common to roast or bake other vegetables unless they were cut up in some kind of casserole. 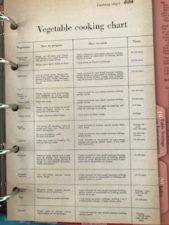 A quick look at the 1953 edition of Better Homes and Gardens New Cook Book advises boiling most vegetables in a small amount of water. My grandmother fried okra, but boiled carrots, broccoli, corn, cauliflower, cabbage, squash, turnips, and green beans. She even made stuffed bell peppers in her pressure cooker, not in the oven. I’m not sure why I started cooking vegetables in the oven, but I love the results! Cauliflower is one of my favorites to roast. I cut it into small florets, then toss it in olive oil, salt, pepper, garlic powder, and red pepper flakes. I roast the florets until they have some black edges. Yum! I wish I had some right now. 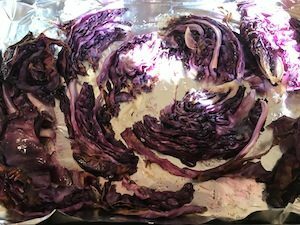 My newest favorite is baked red cabbage with herbed butter. If I start by making extra butter, I can easily turn this into a sheet pan meal by adding pork chops and red seedless grapes. I place the pork chops in the center of the pan and salt and pepper on each side. Then I alternate grapes still on stems and cabbage wedges around the edge of the pan and drizzle all of it with butter. The baking time is the same, but I turn the pork chops halfway through. Melt butter in a small saucepan over low heat. Add rosemary, mint, and garlic. Sprinkle with salt. Simmer on low for 10-15 minutes. Remove herbs & garlic. 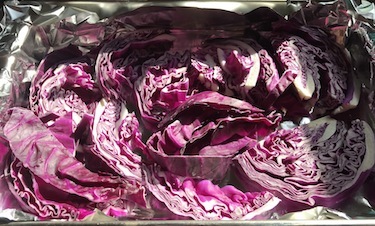 To bake one head of red cabbage, cut it into small wedges and place on aluminum foil in a sheet pan or other baking pan. Lightly salt, then drizzle with herbed butter. (You’ll need 1/4 to 1/3 of the butter for the cabbage.) Place in preheated 375 oven and bake for 40-45 minutes. Serve hot! If you decide to try this recipe, make sure to purchase red cabbage rather than radicchio. While they look similar, the two are not the same. Radicchio is a member of the bitter-flavored chicory family along with Belgian endive, frisée, and escarole. When the cabbage bakes, the color becomes an even deeper purple. It’s a beautiful addition to a plate. And when cooked this way, I prefer the flavor to that of green cabbage. That may be a good thing during cold and flu season. A cup of red cabbage contains 85% of the daily value of vitamin C.
A toasty warm kitchen. A beautiful, delicious, healthy baked vegetable and left-over herbed butter to use on pork chops or include in pasta sauce. OMG! Does it get any better than this?